The Anti Cancer Diet: Simplicity Goes A Long Way In Keeping Cancer Away! If there is one thing all those companies manufacturing a variety of processed foods are not interested in, it is your health. All they do is help you create your own chemical factory – in your stomach. A diet change has to happen now, today! What would you eat if you were living in a forest, away from civilization? 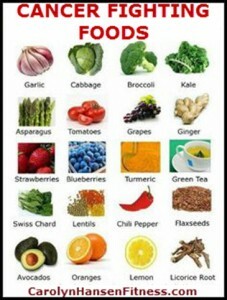 You would probably eat meat, vegetables, fruits, seafood, nuts and seeds. No chemicals, no refining or processing. Just think of how good these foods are. The nutrition profile of these foods makes them invaluable partners of the anti-cancer diet. Since nutrition is one of the major contributing factors for health, a change in this area will almost certainly decrease and possibly entirely prevent the risk of all types of cancers. Commitment and a strong desire will be your closest companions on this journey. You should be happy that no radical changes are expected of you and keep in mind that the reward of a cancer-free life is well worth it. Natural food is all you need. Stay away from processed foods. Consume clean food that is non-toxic, like fresh fruits and vegetables that keep your bloodstream alkaline. Cancer has a fondness for acidic bloodstreams. Consume more of antioxidant-rich foods like vegetables and fruits. They stop cellular damage and protect you from cancer and heart disease. For example, apples contain antioxidant quercetin, a powerful cancer fighter. Other antioxidants such as vitamin C, vitamin E, beta-carotene and selenium are found in abundance in vegetables and fruits. Brightly colored foods are filled with Phytonutrients. They are powerful disease-fighting and immune-boosting agents against lung, breast, gastrointestinal and prostate cancers. For example, grapes. Eat a variety of bright colored foods, since different colors are rich in different phytonutrients. Vegetables, meat or other foods grown using pesticides, herbicides and dangerous chemicals are highly toxic. 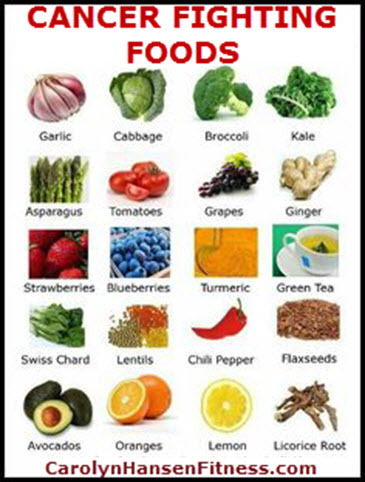 An anti cancer diet consists of completely natural and organic food. It may be more expensive, but it certainly is worth it. Consume loads of natural herbs and spices like garlic, ginger, turmeric, curry powder, basil, coriander, rosemary and others for taste and flavouring, as they contain cancer-fighting properties. Stay away from artificial flavouring of any sort. Cook food in low temperature, as high temperature destroys the nutrients. Raw vegetables, fruits, nuts and seeds are the healthiest form of food. But they can be dangerous if pesticides have been used for growing. So, go raw only when completely organic. How you do it is up to you. Some people like changing their lifestyle overnight and others like to take it one step at a time. The idea is for you to get started with your anti cancer diet and begin making smarter food choices that lead to health and a cancer free life.